This entry was posted in Kayta's Photo Blog and tagged Ojirogawa Valley, Yamanashi. Bookmark the permalink. Wow – now that’s an unexpected photo… I’ve been so busy of late, I’ve not been checking your blog… but that’s one photo I didn’t expect to see. 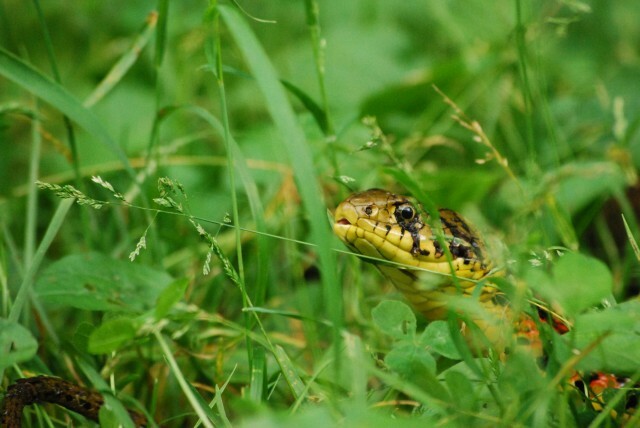 I hope you had a very long lens for that shot, and didn’t do anything silly… Do you know what the snake is? In Australia, snakes are generally avoided like the plague (coz most of them are very poisonous)… I still don’t have a good feel for Japanese snakes though – but would take the same basic approach. Keep away. Thank you for checking my page! I have no idea what kind of snake that is. Maya-san found it, but she was quickly carried away. Snake was very slow due to digesting something , I could clearly see quite a big bulge on/in(?) it’s body. There was no risk at all, but of course I kept the distance.